I just returned from the Cedros Sportfishing trip that I was fortunate to win on Let’s Talk Hook-Up. Let me first again thank you for the trip. Since I had been a few years back with Rick on a Let’s Talk Hook-Up trip I knew what to expect. At least I thought I knew what to expect but I was wrong. Yes, Cedros is still a beautiful, charming jewel of Baja and yes, the fishing is still extraordinary. Our fishing was great for Yellowtail, Yellowfin and Dorado. The Calico Bass at times were missing in action but we got enough to be happy. What I found has changed is best described as the entire adventure has “matured.” When I describe it as matured I am refering to the entire experience. It starts with Rosie’s attention to detail. The emails before the trip were great. Rosie meeting us at the US CBX and giving each of us a package that contained all the complete required paperwork. Then the step by step instructions of what we were going to do once we walked into Mexico. And then having a Cedros Sportfishing representative meet us right away on the Mexico side to again walk us through everything we would do to board the charter flight. It simply could not have been easier. To me this was a sign of maturity. The flight was effortless and we were at the island in 2 hours. There we were met by Richard who quickly became our personal “concierge” for our entire stay. His communication about all aspects of our stay was excellent and he continued to ask if there was anything we needed. This included arranging to fly in Pacificos and the missing ingredients for me to make Palomas (like a margarita made with grapefruit juice). Rick, when we drank the Pacificos we thought of you. Richard and the rest of the staff made our stay great. And to top it off we had the pleasure of having Irviing Terriquez as our Captain for 4 days. What a delightful young man who worked hard and had us on fish all the time. He was outstanding. The communication, flight and the sincere desire to provide the highest level of service all were evidence of maturity. Thank you again for allowing me to have another fishing adventure that I will not forget. I can tell you it is creating a buzz within the Dana Wharf Rod and Reel Club. Rosie, I am looking forward to spending a few days with you next March in Long Beach. Andy and I have already agreed to a contest, who can sign up the most new anglers to fish with Cedros Sportfishing! By the way we did bring lotions for the ladies, t-shirts, candy and stickers. All were received very graciously by the staff. Richard helped us figure out who should get what, it was very easy. "The next day I fished again with Big Al and Patrick on one of the new Cedros Sportfishing center console boats. This 25 foot boat powered by a Yamaha 250 4 stroke outboard was super comfortable to fish on, and is just one of the several top of the line boats you can fish only at Cedros Sportfishing. There is no question- they have the best boats and the best captains on the island. Weather was a bit choppy but Big Al started our day with a 36 pound yellowtail that ended up being the jackpot fish. While Al pulled on the fish, I dropped a Colt Sniper and had amazing calico fishing. Cedros Sportfishing is a cut above…period. There are slightly cheaper lodges, but you get what you pay for and more at Cedros Sportfishing. If you want the best boats, captains, fish processing, accommodations, service and food…there is one clear choice." "I want to emphasis this one more time, we got on a charter flight from Tijuana to start this trip. With the border crossing at the CBX terminal in Otay Mesa, this trip to a remote resort is now as easy as a commuter flight from any U.S. airport. With Cedros Sportfishing, the van rides and 8 + plus hour trips each way are over, unlike the competitor operation that still does these trips. "I was very impressed with the operation at Cedros Sportfishing. Your fish is filleted, vacuumed sealed and frozen every day This is not a large resort where vans are in and out all day with new people coming and going. The group you fly down with is the only group you will see during your stay. I think there as many people working on staff at this resort as there are guests. The rooms are very clean, daily maid service and have air conditioning. The meals are excellent from the dining area overlooking the ocean. I want to hand it to our friend, Rosie Flowers who is now handling the operation. Many of us remember her as a deck hand and in fish processing. She was on this trip with us. I don’t know when she ever stops to sleep or take a break. Her attention to detail and customer service will see that this operation will always stay top notch." New transportation from CBX terminal is outstanding. 2 hour flight and you are on the island. Getting through CBX was effortless. Having transportation the old way and now the new way there is no comparison. Flying out of Tijuana is 100% improvement. Staff as always great no problems. Great people. Love the new coolers for the pangas. Just getting around to sending you all a thank you for the wonderful fishing trip. You and your staff were great in making sure that all the details were worked out, and our stay comfortable. Facilities, accommodations, food, services, etc. were outstanding. Glad to have met Big Al, Patrick and Peter Gray on the trip. Great hosts. Definitely planning future trips back. I am so thankful that I have had the opportunity to have fished with the wonderful people with Cedros Sportfishing twice to experience this fishing adventure. This is not just a fishing trip but truly an adventure that starts the minute to step into the van. The ride down the coastline to Ensenada is beautiful along with all of the people you meet along the way. After a delicious breakfast and a tour of Ensenada followed up by a mariachi serenaded lunch it is time to board the plane to the island. The flight to the island is filled with the anticipation of what the island has to offer. My dreams of catching calico bass and yellowtail until my arms ached were fulfilled. I will never forget pulling up on giant bird schools of yellowtail that were boiling like tuna and heaving my jig into the frothing water to be greeted by many violent strikes which resulted in multiple fish from 25 to over 40 lbs. 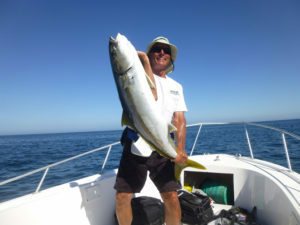 In fact my neighbor went down with the goal to catch he personal best yellowtail and wound up doing that on his very first fish…..!!! He said: “Well what I do now!” My reply was “Keep fishing man!!! He took my advice and caught 5 in a row that all would have been his personal best. The calico bass fishing was so good that our Captain had a clicker to keep track of our daily catch. It is not uncommon to catch over 100 per day per angler only to be released to fight again!!!! Fishing next to this breathtaking island for jumbo yellowtail and feisty calicos is an adventure to never be forgotten!!!! The service is fantastic from everyone as they are wear a smile that comes from there heart. You never need to lift a finger as everything is taken care of. You will need to lift your fork however as the food is outstanding from the ribeye steak to the authentic Mexican cuisine to be enjoyed in the dining room with a million dollar view!!! Don’t just take my word for it come on down and see for yourself why Cedros Sportfishing is a cut above!!! 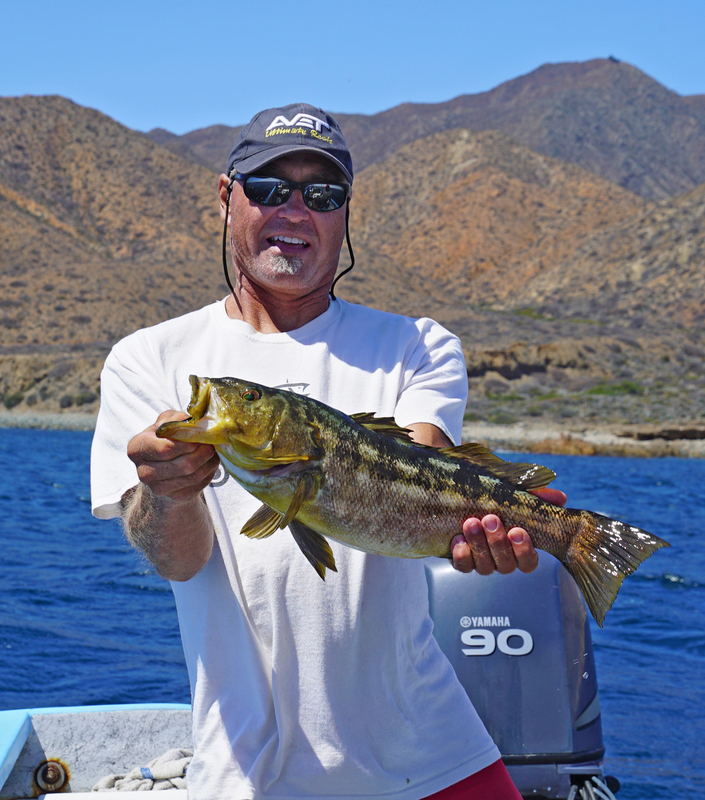 The best Baja California fishing resort I know of just got better. Cedros Sportfishing has added Rosie Flowers to their experience staff to handle reservations and coordinate transportation to and from Cedros Island. Rosie brings a wealth of knowledge, experience and skill with her to this new business opportunity. I have enjoyed fishing in Mexico since 1960. Having worked in the San Diego Sportfishing community I have experienced just about every type of fishing opportunity available to anglers on trips ranging from one (1) to (16) sixteen days in duration. As a private boat owner I enjoyed a variety of different fishing experiences available to anglers in Southern California and Mexican waters. With that said, fishing for big yellowtail with Cedros Sportfishing is the most fun I have ever had on the ocean. Fishing with the crew from Cedros Sportfishing is a unique fishing experience. It begins and ends with the great of people who go out of their way to insure your trip will be fun, safe and productive. From the moment your trip begins until you return home, the staff takes care of every detail of your vacation. Here are just a few of the things that make Cedros Sportfishing exceptional. Let's start with Rosie. She is your original point of contact and keeps you informed of everything you need to know about your trip. She can answer any questions you have regarding reservations, transportation, fishing tackle, Mexican regulations and fish processing. The staff will provide you with great food, clean rooms, transportation to and from the boats and even do your laundry daily limiting the amount of clothing you need to bring with you. 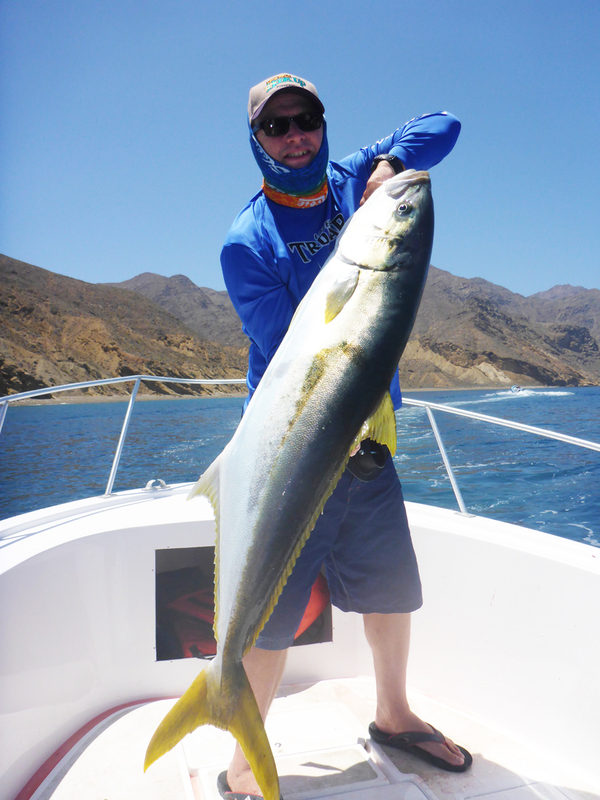 In my opinion, there is no better place to fish for really big yellowtail than at Cedros Island. The 26 foot panga fishing boats allow you to fish for 30 to 50 pound fish in areas not accessible to lager sportfishing vessels. 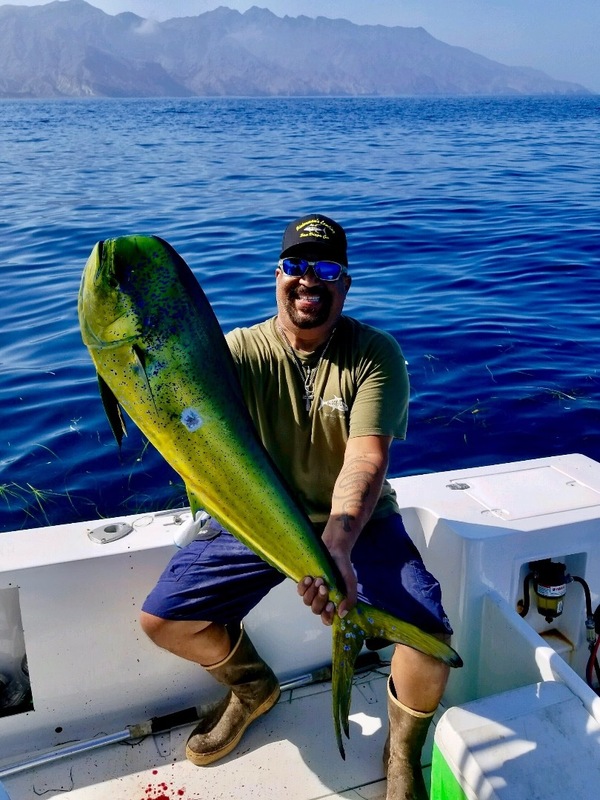 It is not uncommon to catch these big yellowtail in water that is only fifty feet deep. 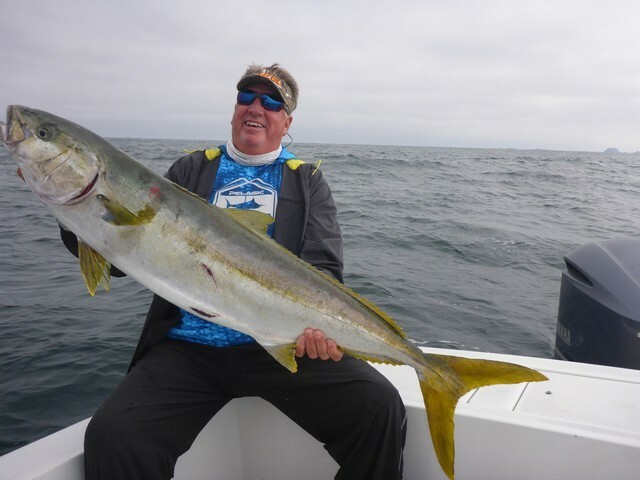 I do not know of any other location on the baja coast where an angler has a better chance of landing a trophy yellowtail than at Cedros Island. If you like to throw the surface Iron for big fish you can wear yourself out catching yellows and jumbo calico bass. If you are looking for a different type of fishing vacation, I highly recommend taking a trip with Cedros Sportfishing. I have made this trip three times in the past five years catching a personal best yellowtail weighing 52 pounds. Every trip I have caught at least one fish over 40 pounds. It is the best place I know of to target big yellowtail with a good chance of catching a tropy. I was fortunate to be one of the first guests to experience Cedros Sportfishing several years ago, and have seen a great fishing experience grow into a spectacular one. The lodge is beautiful, the food is fantastic, accommodations are very comfortable. Being the "first in" , Cedros Sportfishing was able to acquire the best fishermen and the best boats on the island and teach them to be world class guides. Everything about the operation is first rate. Flying to Cedros in itself is an adventure, and when you get there things just keep getting better. I highly recommend a trip to Cedros Sportfishing, it will most likely not be your last. 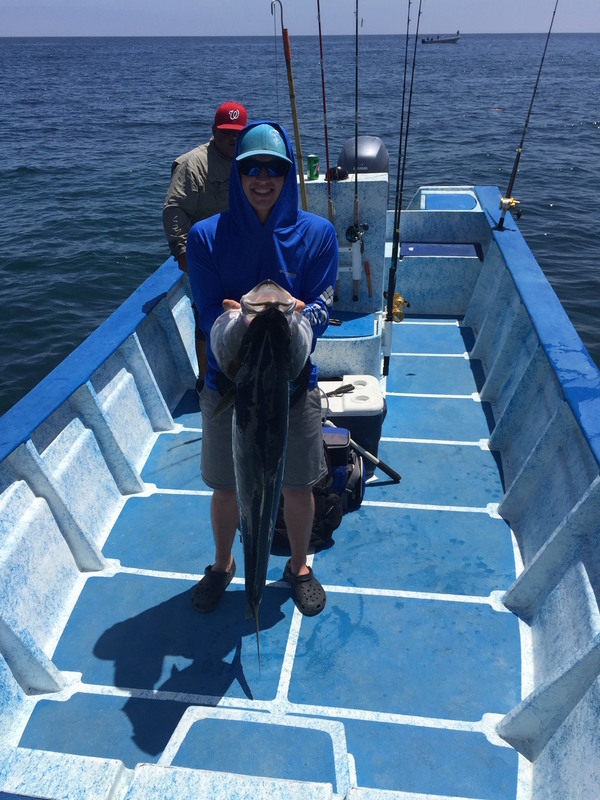 My husband and I fished six days on Cedros Island with Cedros Sportfishing! I am new to sportfishing and had an amazing time! I was a bit worried for my husband who, at the time, had two bad knees and did not move well at all. We could not have asked for better service and the staff were very accommodating in helping my husband. From the time we got on the van all of us on the trip never had to touch our luggage or gear again!!! Our gear was loaded on the boat in the morning BEFORE we arrived and was taken back to the beautiful facility when we were finished; THEN all our gear was rinsed off with fresh water! We loved the total experience so much we are booked on another six day in July! I'm looking forward to my 2nd trip with your fine operation. The fish processing your crew does is outstanding & surpasses the San Diego Long Range fish, which of course is pretty good. See you in August! We knew Cedros Island was going to be epic, however, we didn't fully realize how good the fishing would be. We would limit on 15-35 lb yellowtail in the morning then spend the remainder of the day fishing for huge calico bass, grouper, and white sea bass. Our freezers are full and we're looking to book another trip in mid to late June of next season. Please let us know if you would be interested in joining. It will be an investment in a vacation you'll never forget! If you've never ocean fished, you'll have zero issues. You can arrange for rental tackle that is state of the art and panga captains will guide you through everything you'll need to do. We were met at the Tijuana border crossing by Rosie Flowers, an incredibly well organized administrator for Cedros Sportfishing, who had all the necessary paperwork and instructions ready to go. We crossed the border, boarded the plane, and were off to Cedros. A beautiful 2-hour flight down the Mexican coast. Upon arrival at Cedros Island, we were met by Cedros Sportfishing staff who loaded all of our gear and transported it to the Villa. A few guys decided to go fishing that afternoon (and limited on yellowtail) while the rest of us kicked back around the Villa. We were fed Quesadillas with homemade salsa, ceviche, sashimi, nachos, and whatever else we requested. Dinner the first night was steak and chicken fajitas with fresh made tortillas and grilled peppers. As you can imagine, we all had a tough time sleeping the first night, however, our air conditioned rooms were so comfortable that we had zero complaints. When our alarms went off at 5am, we headed down to the kitchen and gorged ourselves on chorizo and eggs with fresh salsa and tortillas. We were transported down to the harbor where we boarded Pangas and headed out for a days fishing. Each Pangas captain was extremely knowledgeable about local fishing conditions and locations where we would get into good amounts of fish. The captains were extremely interactive and we had a great time fishing, joking around, and creating memories to last a lifetime. When we arrived back each evening, we were transported back to the Villa for more delicious appetizers, dinner, and drinks. Our fish were all filleted by the staff and all we had to do was relax and enjoy the sunset. For what you pay, you'll receive round trip airfare down to the Island, transportation around the Island, all meals, appetizers, and non-alcoholic drinks, air-conditioned rooms, pangas with captains, and fish fileting and packaging in vacuum sealed bags. For more info hit the "Read More" button above. This is a great vacation for the experienced fisherman or the novice. The youngsters who joined us were treated very well and has a great time. Please think about joining us next year! Twelve SCTC members and guests were bussed from the club parking lot to Otay Mesa where we easily crossed the CBX into the Tijuana airport. After a pleasant two hour flight we arrived at Cedros Island and were taken to the beautiful Cedros Sportfishing lodge. For the next four and one half days we fished from well equipped pangas for yellowtail, dorado, and calico bass. Two pangas made a bumpy crossing to the San Benitos Islands where they were rewarded with eight wahoo. The quality of the yellowtail was outstanding with most weighing from thirty to forty-five pounds. Dorado fishing was off the charts with daily limits of twelve to fifteen pound fish for everyone. Calico bass fishing was spotty as the fish were feeding exclusively on abundant red crabs. The lodge was very comfortable, the food was excellent, and the service was amazing. We had an easy return flight, border crossing, and bus ride home. Special thanks to Paul Harris for arranging bus transportation and to Rosie Flowers for putting the trip together. We had a fabulous time and hope to do it again next year! I was with the Labor Day group with Alan Tani, and I just wanted to drop a line to say what a great time I had at your resort. The style of fishing was just what I like...plenty of challenging fish, but no 100 lbers, caught with relatively light gear from a panga with only a few people on it. But more importantly the resort, while still Mexican-style rustic, was clean, everything worked, was safe, and had great service. I especially liked that Richard told us to leave all our valuables behind during the day and they would look after them. That can be the biggest hassle of fishing in Mexico....worrying about a passport, wallet, and laptop while out fishing all day, and on Cedros I never gave security a second thought. The meals were also excellent. Breakfast, lunch, and dinner were all I could ask for (although the size of the steak the last night was a little bit over the top!). I'll definitely be looking forward to coming back next year if I can get a holiday weekend pass from my wife (I'm working on it). Looking forward to seeing you and your crew again then. We had a great trip. You and the staff were fabulous! This was the yellow tail trip I have ever been on. The food was great, the accommodations were perfect and Richard treated us like kings. We had fresh yellow tail for dinner tonight and it was delicious. I just wanted to send a note to say Thanks! I had a great time, as did the rest of our group. I’ve never really fished, but Javier made it very easy and fun for me. He was helpful, had a great attitude, and taught me a good deal. I was pretty hesitant on coming down there as all my friends were very much into fishing, and I really just like hanging out on a boat with a beer. I doubt I’ll ever do a ton of fishing in my life, but I really enjoyed my time down there. I will definitely recommend the trip to my many friends that are very much into fishing. The trip was super convenient, the people were great, the food was great, and the accommodations were excellent as well. I’m guessing just about everyone that goes on that trip is all about fishing, and is excited to go dawn to dusk every day. I don’t know if it is even remotely possible as an option, but it would have been nice if there were an alternate option for an afternoon: paddle boarding, or a sunset cruise with cocktails comes to mind. I’d be more than happy to come back exactly as it was though.